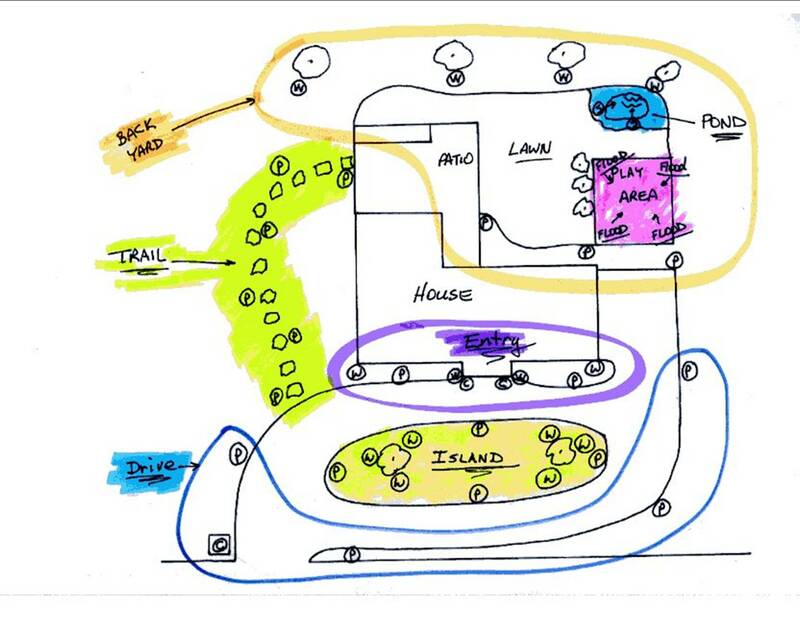 One of the first questions a landscape lighting designer or contractor must ask a client is how they intend to use their outdoor space – and what the primary motivation is for them to be adding this new lighting. One of the mistakes that inexperienced lighting designers make is to assume how the client will be using their outdoor living space and lighting. After all, the client is the one who lives there 365 days per year and not the designer. 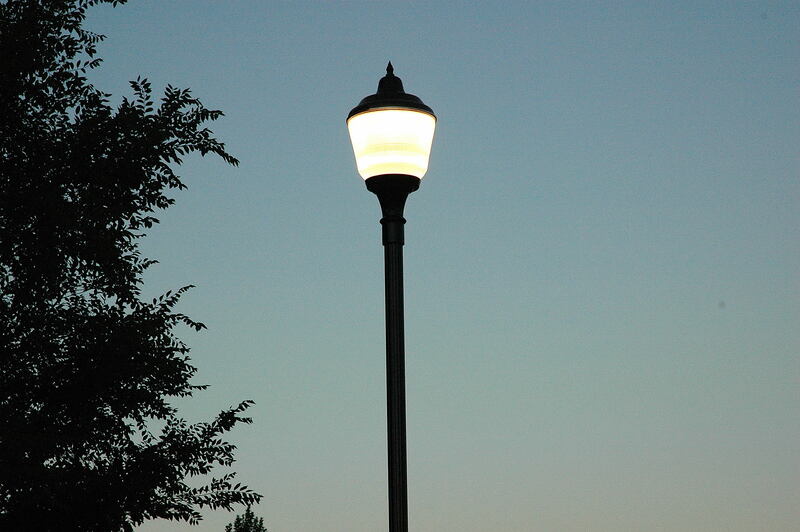 Landscape and outdoor lighting provides aesthetics, safety, security, and usability for a homeowner’s property. Oftentimes, homeowners will want the lighting for all four of the above categories or as few as one; e.g., security. If security lighting is the primary purpose, then chances are the homeowner will want to have the lights operate from dusk to dawn – and from a control standpoint you would only have to have one zone. If the primary purpose of the lighting is for aesthetics only and the homeowners go to bed around 11:00 PM every night, then there’s no point in increasing their electricity bill to operate the lights until 3:00 AM if they are not awake to enjoy them. The same thing can be said for usability of the outdoor living space. If the pond has been drained for the winter and there are three-foot deep snow drifts on the back patio, most homeowners will not be outside barbecuing in the dead of winter – and probably will not be using their lights quite as much. 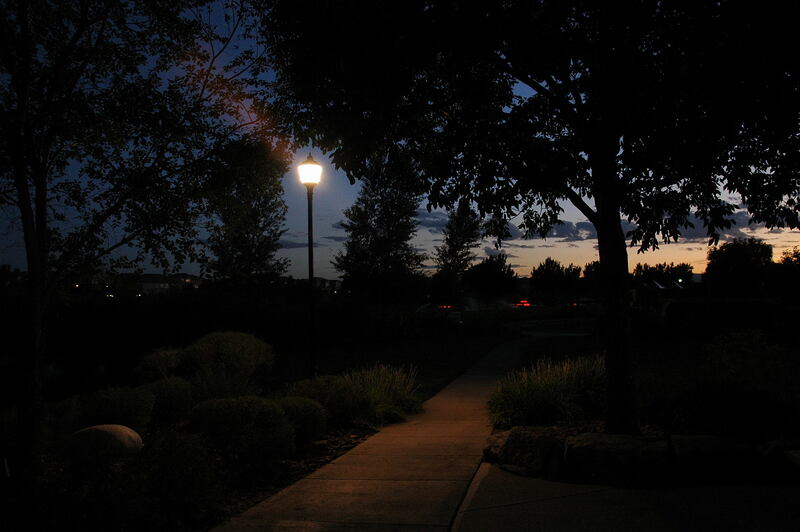 As far as safety, most homeowners do typically like to leave a few of their lights on all night long whether they be carriage lights by their front door or a few landscape lights to light the way along the sidewalk. All of the zones have been programmed to turn on and off automatically, but the homeowner can turn off any of these zones manually using this 8-button switch. So even after the installation of the low-wattage LEDs, no energy will be wasted at this homeowner’s house. 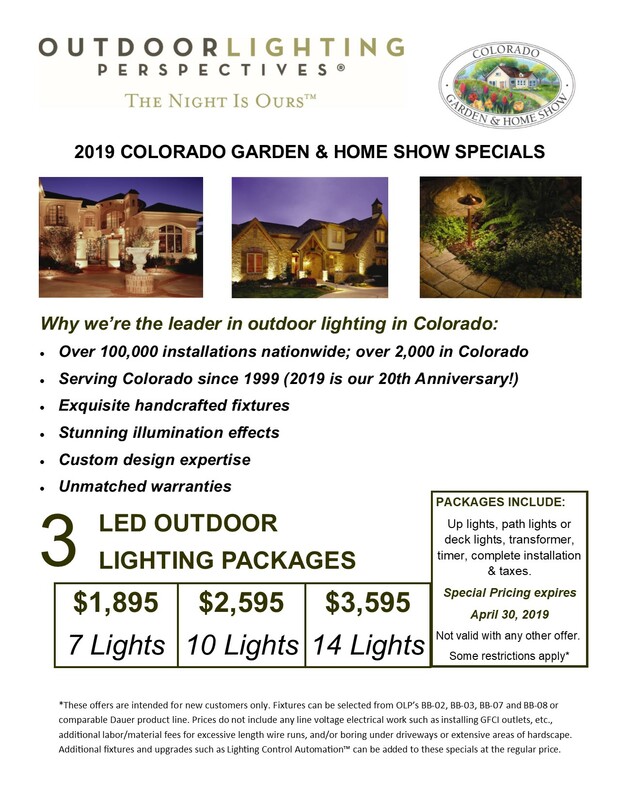 Most homeowners typically want to control their back yard lights separately from the lights in the front yard – and they typically have their front yard lights operate for a few hours longer. We have also installed quite a few systems where the homeowners operate the path lighting all night long but have the uplighting for the house and trees turn off at midnight or earlier. 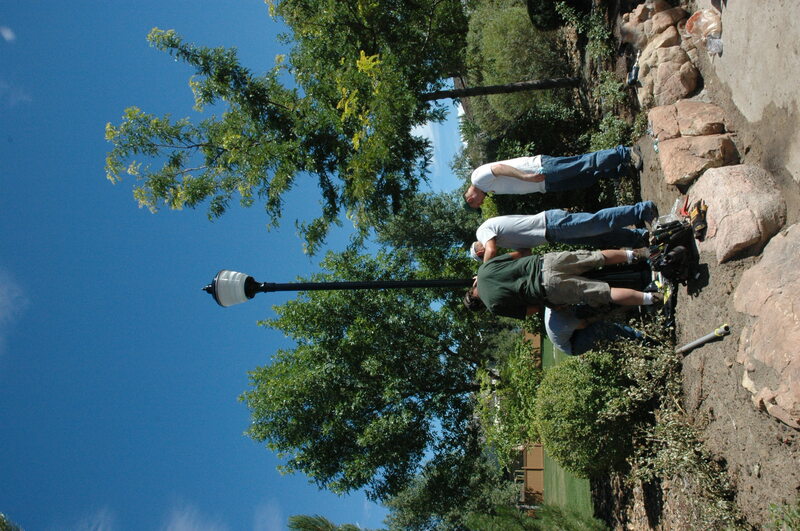 We once did a landscape lighting installation for a former Denver Bronco offensive lineman. We had lit up his kids’ jungle gym but he wanted to be able to turn those lights off when he had get-togethers at his house with his team mates. He didn’t want anything to get broken – neither the play equipment or his fellow team mates. For smaller properties that require fewer landscape lighting fixtures, there is typically not much of a need for separate lighting and control zones – and separate zones can unnecessarily drive up the installation cost for a small system. For larger systems, however, separate control zones can help a homeowner save money on their monthly electric bill while also helping the environment. 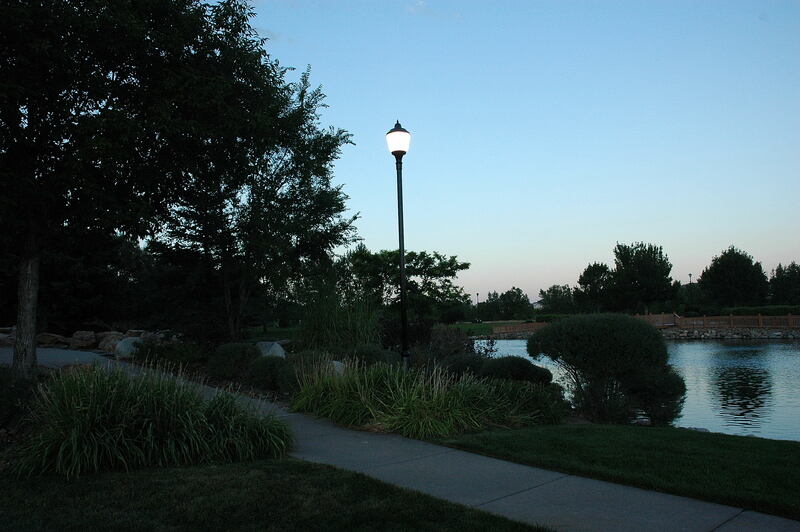 Our company, Outdoor Lighting Perspectives of Colorado, just completed its latest lighting project at a community park – the Piney Creek Park near the intersection of East Orchard Road and South Joplin Way in the City of Centennial. 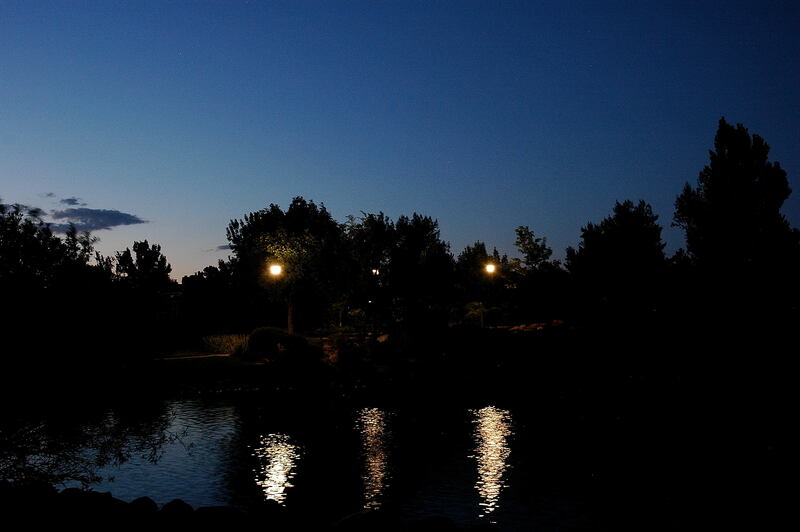 The picnic area next to the beautiful lake and water feature in the Piney Creek Park had been without functioning lighting for several years. The six four-foot tall bollard lighting fixtures that had been installed there previously were vandalized and damaged beyond repair. 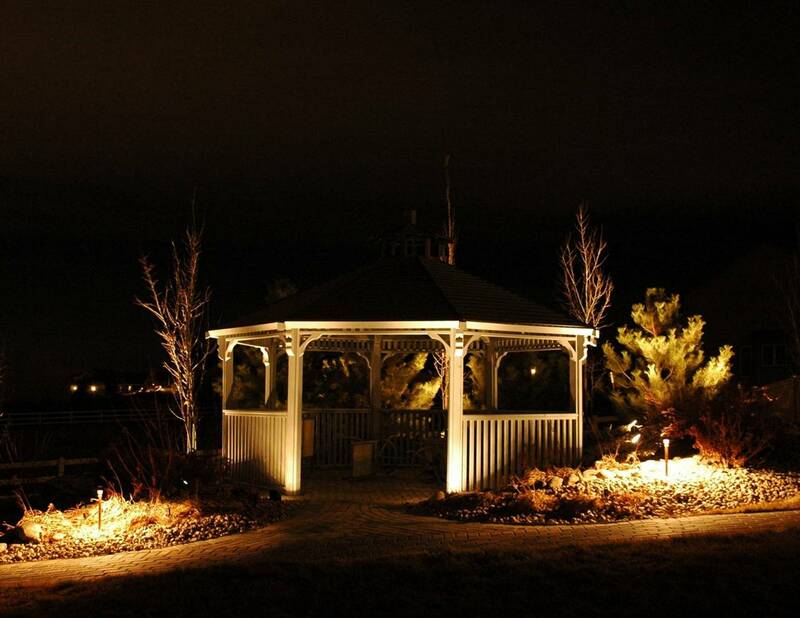 The home owners’ association (HOA) realized that they needed a different lighting solution that would not only deter vandalism but also enchance the beauty and usability of the park throughout the year. What we specified and installed are the 14-foot tall, LC-40 pole lamp posts (150W Ceramic Metal Halide (CMH)) manufactured by our national company in Nashville, Tennessee. The lamp posts are made of cast and extruded aluminum – and for this installation they were powder-coated black for an elegant and traditional look. 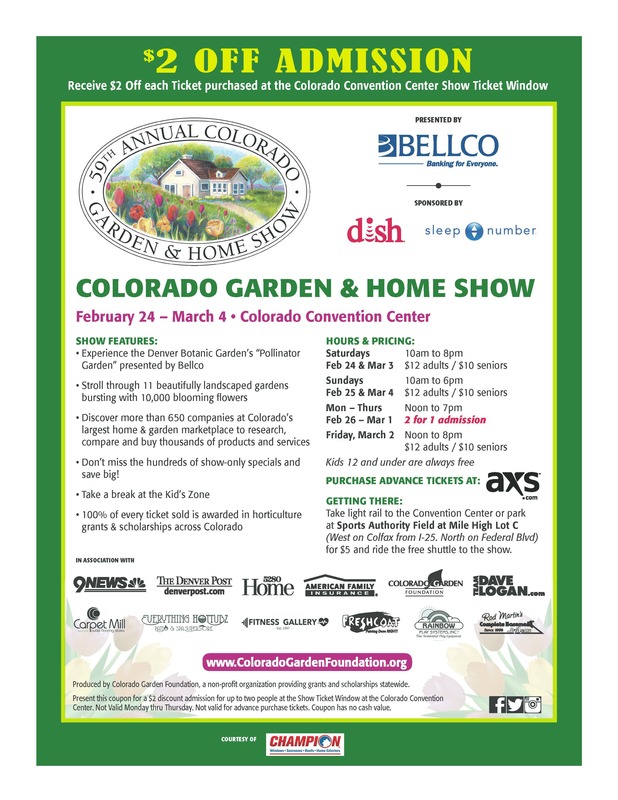 What really sets these lamp posts apart from any other installation you’ll see in Colorado today is the use of the Ceramic Metal Halide (CMH) bulb technology. These CMH bulbs with a life of 18,000 hours generate 12,000 lumens while producing a Color Rendering Index (CRI) ABOVE 90! What that means is that the flowers, trees, and rocks, etc. look the same way illuminated at night as they would appear during the daytime. What a concept! And unlike regular metal halide bulbs, CMH bulbs never experience any sort of color shift; i.e., the CMH bulb will always provide a pure white light from the first day it is turned on until the day it burns out. As a comparison, the current LED technology can generate at best only 50 lumens per watt while the current CMH technology can generate 80 lumens per watt. LED technology is rapidly improving but it still has a way to go to compete with CMH technology where you need to have a lot of light (lumens) at the ground level. All of the lamp posts were mounted on four-foot deep, two-foot diameter concrete caissons with engineered rebar cages to withstand the higher wind loads that we encounter along the Colorado front range. I’ve attached some additional photos of the construction phase as well as some additional nighttime photos taken after the installation.